For 2,000 years, the peach was the iconic fruit of China, an auspicious symbol of good health and a long life. 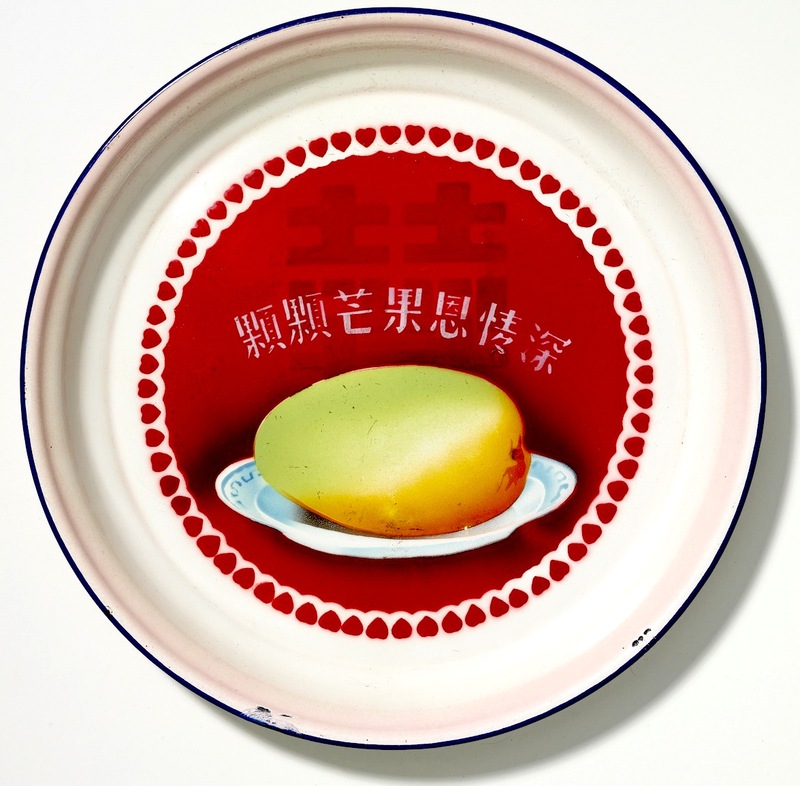 But from August of 1968 until roughly the fall of the following year, the mango was China’s most revered produce item, whose meaning was unwittingly bestowed upon it by none other than Mao Zedong. Now an exhibition about the mango’s short-lived sanctification has opened at Museum Reitberg in Zurich, Switzerland. Continuing through June 16, 2013, the show is organized around more than 60 Mao-era mango items—from Mao mango medallions to textiles bearing mango imagery—donated to the museum by scholar and author Alfreda Murck, who also edited the exhibition’s catalog and will be speaking at the Capital Literary Festival in Beijing on March 2, 2013. The circumstances leading to the mango’s prominence as a symbol of the working class have their roots in 1958, when Mao Zedong instituted a series of agricultural and industrial reforms known as the Great Leap Forward. Within three years, an estimated 30 million Chinese citizens were dead, most lost to starvation caused by the program’s ill-conceived and occasionally oppositional policies. 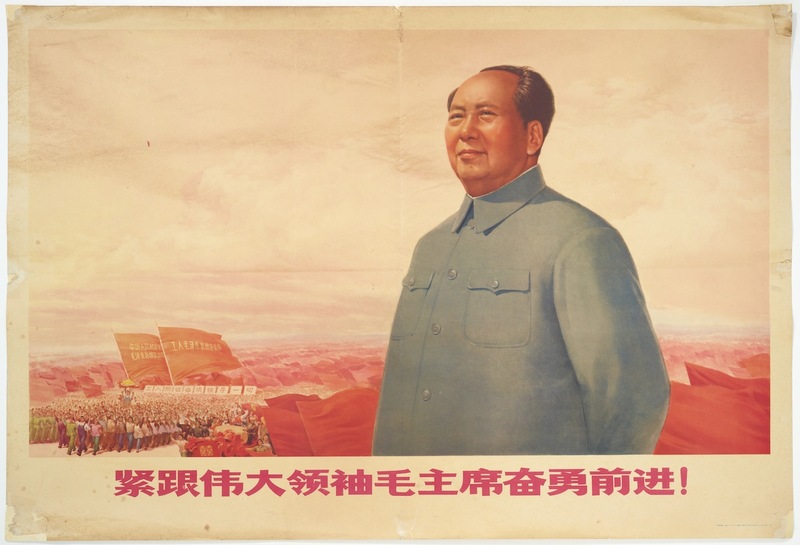 By the early 1960s, with Mao’s credibility and popularity at an all-time low, a new initiative was needed to revive China’s economy, as well as the political fortunes of its beleaguered leader. That movement became the Cultural Revolution, which began in 1966. One by-product of the Cultural Revolution was the spontaneous formation of zealously pro-Mao student groups, whose young, idealistic members had not lost faith in their charismatic Chairman. If such devotion sounds naïve to 21st-century ears, then maybe it won’t come as a surprise that the first of these organizations was formed at a middle school in Beijing. Calling themselves the “red guards who defend Mao Zedong Thought,” the students received Mao’s personal blessing, which spawned countless other Red Guard units at middle schools, high schools, and universities across the country. Though unified by their loyalty to Mao, these Red Guards units were often fierce and even violent rivals. The animosity between Red Guards peaked in the spring of 1968 at Qinghua (also spelled “Tsinghua”) University, where two oppositional cadres, the Jinggangshan Corps and the Fours, engaged in what became known as the Hundred Day War, hurling stones, spears, and sulfuric acid at each other in a bitter struggle to prove their obsequiousness to Mao and his teachings. The skirmishes sent more than half the university’s students fleeing, and by late July, even Mao had had enough. On July 27, 1968, Mao sent 30,000 Beijing factory workers, dubbed the “Capital Workers Mao Zedong Thought Propaganda Teams,” to interpose themselves between the Jinggangshan and the Fours in an orchestrated attempt to keep the peace. About half a dozen workers were killed and more than 700 others were injured, which prompted Mao to disband his beloved Red Guards the very next day. Which brings us back to the mangoes. One week after Mao dissolved the Red Guards, on August 4, Pakistan’s foreign minister, Mian Arshad Hussain, and his wife met with the Chairman. It was not an especially momentous occasion on the order of, say, President Richard Nixon’s trip to China in 1972. Rather, it was your basic, run-of-the-mill courtesy call from a foreign dignitary paying homage to a bigger, mightier neighbor. And because China is a gift-giving society, Mr. Hussain brought a case of mangoes with him, in the same way that you or I might stop off at the liquor store on the way to a party to pick up a bottle of wine so we don’t arrive empty handed. 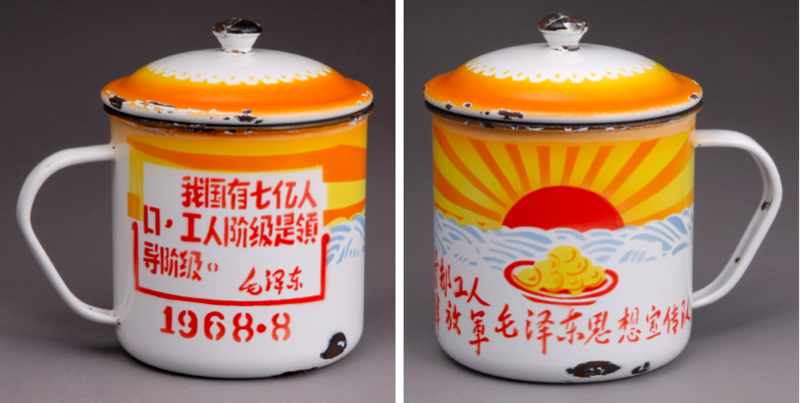 In this cotton textile from 1968-69, a bowl of mangoes is juxtaposed with the Nanjing Bridge (right), which opened at the same time as the mango craze. The sunflowers facing the sun are supposed to represent loyal subjects, while the Great Wall (an engineering precursor to the Nanjing Bridge) can be seen at upper and lower left. 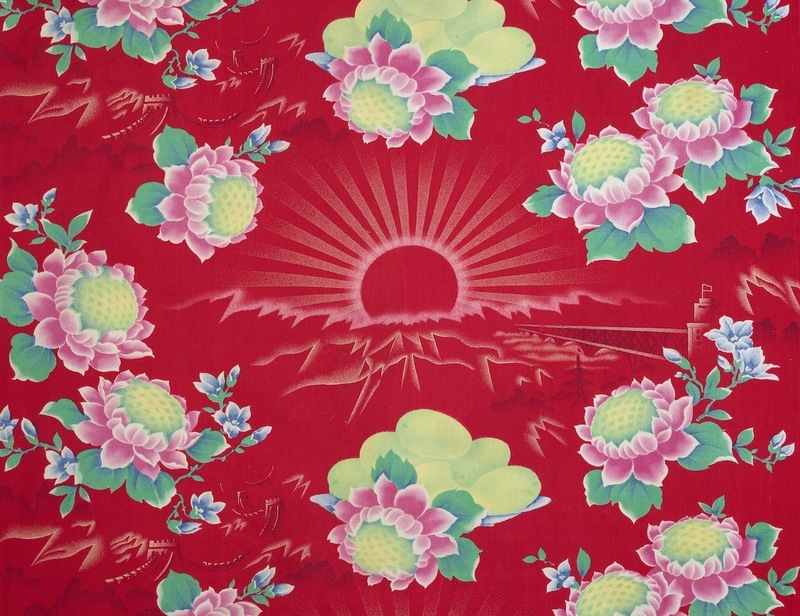 According to a 2007 article Murck wrote for the Archives of Asian Art, workers stayed up long into the night after the mangoes arrived, discussing their meaning and Mao’s intent. Most of the workers had never seen a mango before, or even knew what to call it, since the fruit was not native to this part of China. It must have seemed unimaginably exotic, which may help explain why in a photo of the workers at Qinghua standing amid their newly arrived mangoes, a calligraphic message in front of the fruit reads, “Respectfully Wishing Life Without End to Chairman Mao.” Thus, in just 24 hours, the mango had absorbed the meaning of the iconic peach, China’s most venerable symbol of immortality and long life. This aluminum pencil box bears the same inscription as the bell-jar vitrine shown at top. 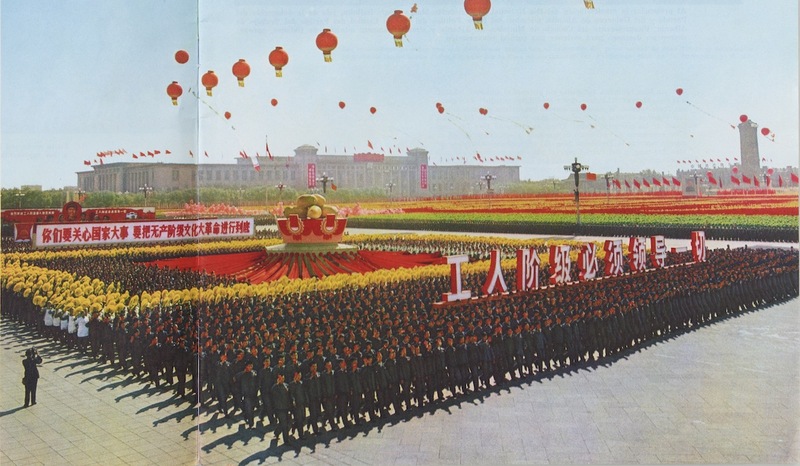 After the People’s Liberation Army moved in to assume peacekeeping duties at Qinghua (they were always the true power behind the throne), the workers returned to their respective factories. Each of the eight factories that supplied workers to the Propaganda Teams received a Pakistani mango from the original case. If the workers were treated like heroes upon their return, the perishable mangoes were given the sort of deference usually reserved for religious relics and artifacts. 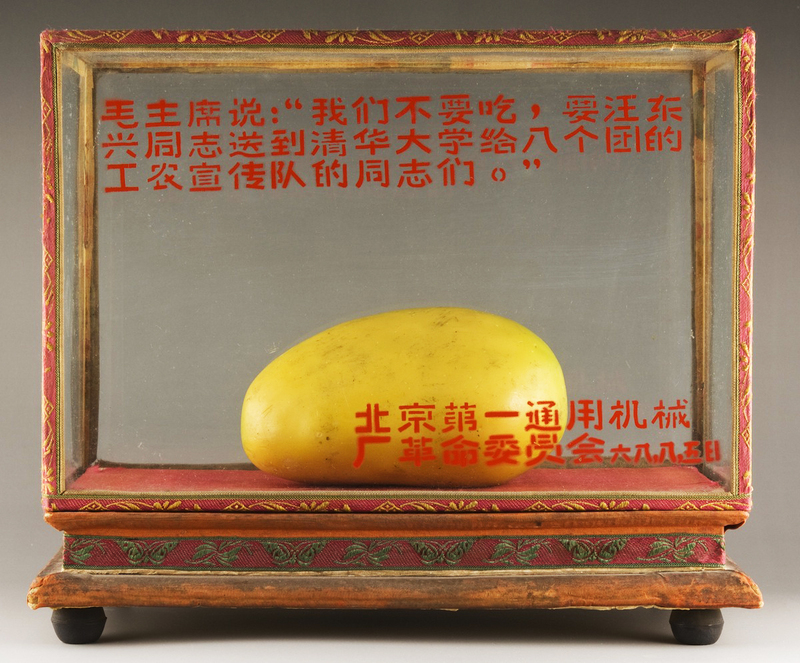 One factory preserved its mango in formaldehyde, another tried to stem the fruit’s decay by sealing it in wax before placing it on an altar so that factory workers could solemnly file by to pay their respects to this token from on high. When that mango began to rot through its porous wax shell, it was peeled and boiled in an enormous pot of water—each factory worker was permitted a teaspoon of the precious fruit’s sacred broth. 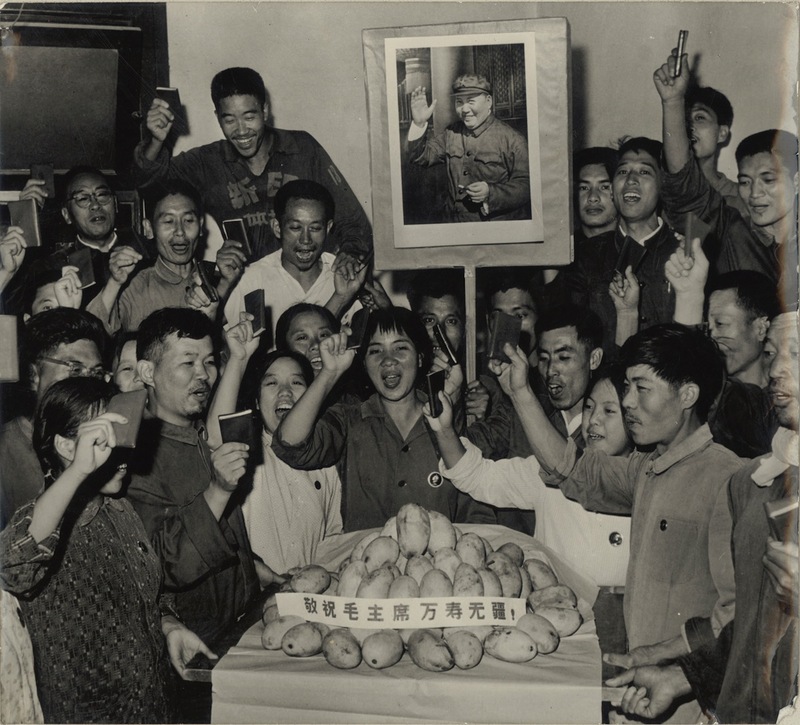 For his part, Mao was reportedly surprised and even amused by the cult that grew around the mangoes he had sent to Qinghua. 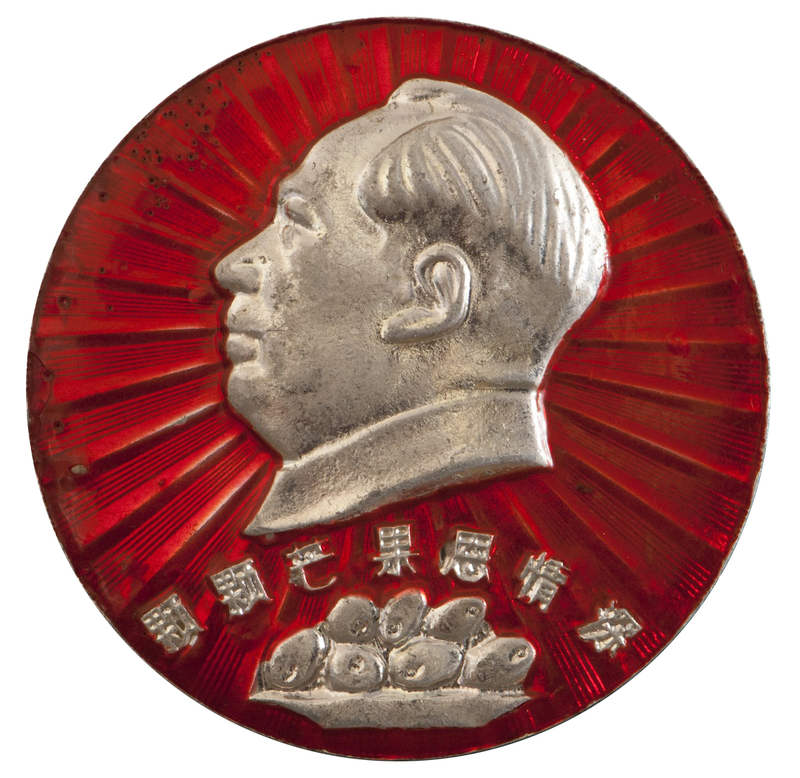 But the fictions that swirled around the fruit, which was described as “a precious gift received from foreign friends” rather than just a token from an ingratiating neighbor, served Mao’s agenda well. This aluminum and enameled medallion bears the same inscription as the enamel tray shown above. Others who failed to show proper respect for wax facsimiles of Mao’s mangoes did not get off so easy. In her 2007 essay, Murck tells the story of one Fulin villager’s fatal encounter with a mango that was being toured around the country. “The burlesque silliness of the traveling mangoes would be amusing except for the fanatics who took pleasure in enforcing ideological conformity,” Murck writes. She goes on to tell the tale of a little boy who was “crestfallen” with disappointment upon seeing the mango, but had the good sense to keep his opinion to himself. When the village’s dentist, Dr. Han, saw the mango, he was equally unimpressed, but made the mistake of saying so. Looking at photographs of the parade through contemporary Western eyes, it’s difficult to imagine anyone taking all this seriously, but there it is, an enormous float shaped like a basket piled high with gigantic mangoes. Almost overnight, the image of this float, sometimes paired with the Nanjing Bridge, would decorate textiles and propaganda posters. Wax and plastic mangoes were also in demand. 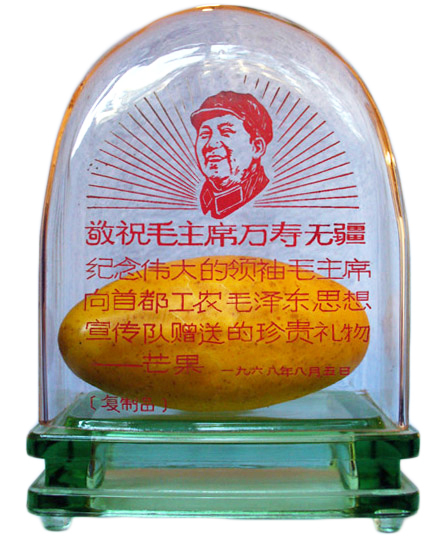 For those not fortunate enough to work in one of the factories that had supplied workers to Mao’s Thought Propaganda Teams, department stores sold bell-shaped glass vitrines meant to hold a plastic mango. 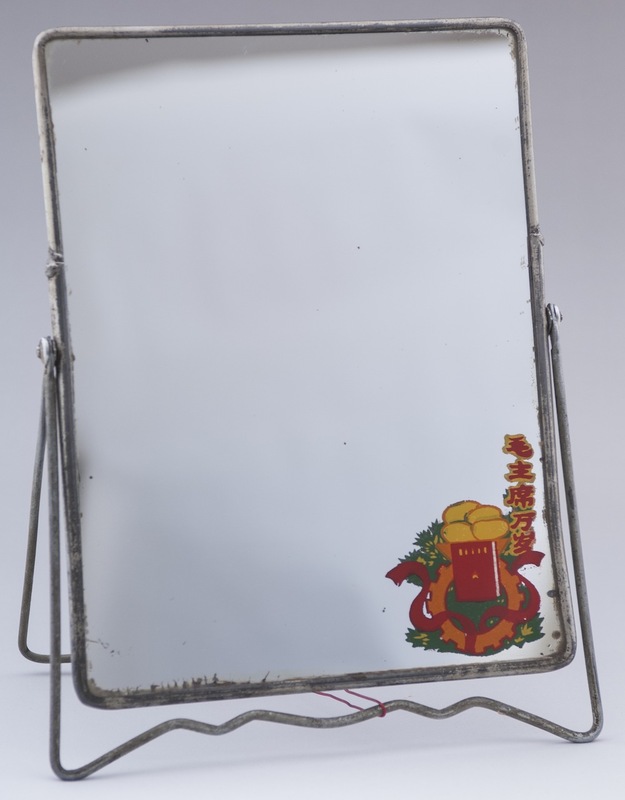 Mangoes accompanied by patriotic slogans and portraits of Mao also decorated enamel mugs and trays, packs of cigarettes, pencil cases, vanity mirrors, and medallions. Today, you can still purchase an authentic mango item from 1968 or ’69 for relatively little money, but you have to know where to look. “The funny thing is they’re very modestly priced,” says Murck, “You can get a piece of printed cotton for 40 to 80 renminbi, which is about $6 or $12, although glass reliquaries containing wax mangoes can command as much as $500. In general, you have to go to the flea markets in Beijing, and you have to know who to talk to. The vendors are asked not to sell these pieces, especially to foreigners, so you have to call them the night before and say, ‘I’m coming tomorrow. Could you bring some of your contraband from home?’ It’s not exactly encouraged,” she says. I know of at least two markets in Beijing where these are on open display and no one has ever told me that they have been discouraged from displaying or selling to foreigners. I bought my first glass dome wax mango about 12 years ago and purchased a number on-and-off for several years only giving up as prices continued their upward spiral – the most recent one I was offered 4 months ago for about $800. Love it! Love mangoes and Mao! Long live the Working Class! The sad part of this is that the fanatical devotion to the Party and to corrupt leadership is still very common in China. Many people are still afraid to voice even mild skepticism of the government. Oh, it’s not that hard to imagine. Just look at American university campuses today, and the nonsensical ideas that are taken quite seriously there. There is NO laughing at them. Contradict them at your peril, you will be expelled (not quite execution, but the harshest penalty available). Interesting stuff. Scary stuff. The nonsense that individuals will tolerate—even actively promote—in order to remain a part of the group. Perhaps Vetraio50 was being merely ironic in writing “Long live the Working Class!” It’s right there in the third paragraph that Chairman Mao and his communist policies murdered 30 million people in a few years. You could call him Hitler Mao though Hitler could only dream of murdering so many children, men and women. No song long-lived were they. Ah, Mangoes. And all statues must be pulled down! Even giant mountain monuments. Everything must be renamed! “If such devotion sounds naïve to 21st-century ears…” Thinking that this kind of thinking is naïve is itself naïve. Signaling spirals are very difficult to stop. Where’s Cromwell when you need him? “ ” When I first looked at the book in the Newberry Library, it just felt operatic to me.